This article was last updated Jan 11, 2018, but some terms and conditions may have changed or are no longer available. For the most accurate and up to date information please consult the terms and conditions found on the issuer website. Getting out of debt is a perennial favorite on New Year’s resolution lists. For those yearning to be debt-free, the secret sauce to turn that resolution into reality is surprisingly simple. In a new survey by CompareCards.com we asked 1,000 U.S. adults who tried to pay off debt in 2017 which habits they adopted to reach their goal. The survey was conducted Jan. 2-Jan. 5, 2018. Forty-seven percent said paying off debt was one of their New Year’s resolutions. Last year, 64 percent of Americans who set a goal to pay down debt succeeded. Among those who said they succeeded, the average amount of debt paid down last year was $7,500. Reducing spending was the most popular tactic people used to pay down debt (61%). The gig economy was a distant second as 20% reported taking on additional work. Try, try again: For nearly 60 percent of Americans, 2017 wasn’t the first time they tried to pay off debt. More than one-third (36%) said they’ve tried at least three times or more, including 2017. Sixty-two percent say they’re very confident or extremely confident that they’ll be able to get out of debt (or stay out of debt) in 2018. 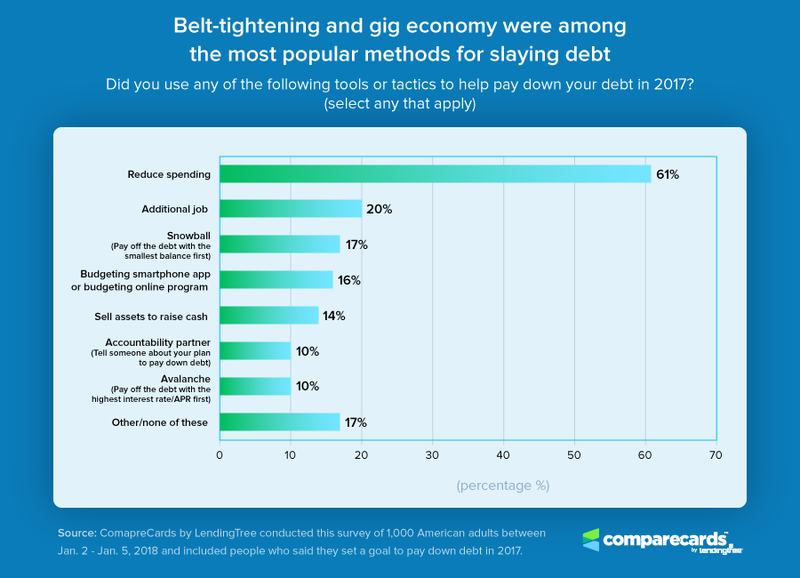 We asked respondents to tell us which tools or tactics factored most in their debt-payoff strategy. Developing a specific plan to pay off debt. Seventy-five percent of people who succeeded paying off their debt developed a specific plan to pay off debt last year, according to the survey. By comparison, just a little over half (51%) of those who tried to pay down debt but failed said they had a plan. Reducing spending. This was the most popular tactic used to pay off debt. Sixty-one percent of survey respondents said they reduced spending. Building an emergency fund. The majority (64%) of Americans who successfully paid down debt in 2017 also had an emergency fund. In 2017, 64 percent of Americans who set a goal to pay down debt succeeded. It turns out that creating a detailed plan was the difference between success and failure for Americans who paid off debt. Seventy-five percent of Americans who developed a specific plan to pay off debt last year succeeded versus 51 percent of those who did not succeed. Sixty-six percent of those who succeeded cited cutting spending or setting a budget plan as the primary reason they met their goal. Cutting spending is the number one tactic cited by those who successfully slayed debt in 2017. Harrine Freeman, owner of H.E. Freeman Enterprises, a financial counseling service firm, points to her personal experience with credit card debt. “My total debt was $19,000 and my salary was $21,000. It took 4 years to pay off all my debt,” Freeman said. To pay off her debt, Freeman spent money only on basic necessities. She stopped eating out and packed her lunch every day. She stopped going to the hair salon and didn’t buy any new clothes. One of the most popular plans to pay down debt was the snowball method, which focuses on paying off the smallest balance first and working your way up to the largest balances. Nearly one in five (17%) of people who successfully paid off their debt in 2017 cited using the snowball method. The majority (64%) of Americans who successfully paid down debt in 2017 had an emergency fund, the CompareCards.com survey found. The median size of the emergency fund among those surveyed was $3,500. Financial experts typically recommend building up an emergency fund equal to six months of living expenses (or more, if you have an unstable income or a larger family). This is a critical safety net to prevent people from racking up additional credit card debt. The people who were successful at paying off their debt last year appear to have a less chronic experience in paying off debt. And they’re optimistic it won’t be an issue again — 76% of the successful said they are “extremely” or “very” confident they’ll be able to pay down/stay out of debt in 2018. Some 44 percent of respondents said 2017 was their first time setting a goal to pay down debt. But for 70 percent of those who said they were unsuccessful at paying off their debt, 2017 wasn’t the first year they tried. Repeat failures represent over one-third (37 percent) of those who said they were unsuccessful at paying off their debt. The bigger picture: Rising debt in the U.S. Despite a strong labor market, still-growing economy, and surging stock market, Americans tacked on another $43 billion to their credit card balances during the 2017 holiday season (Nov.-Dec.), according to a CompareCards.com analysis of Federal Reserve data released in early January. 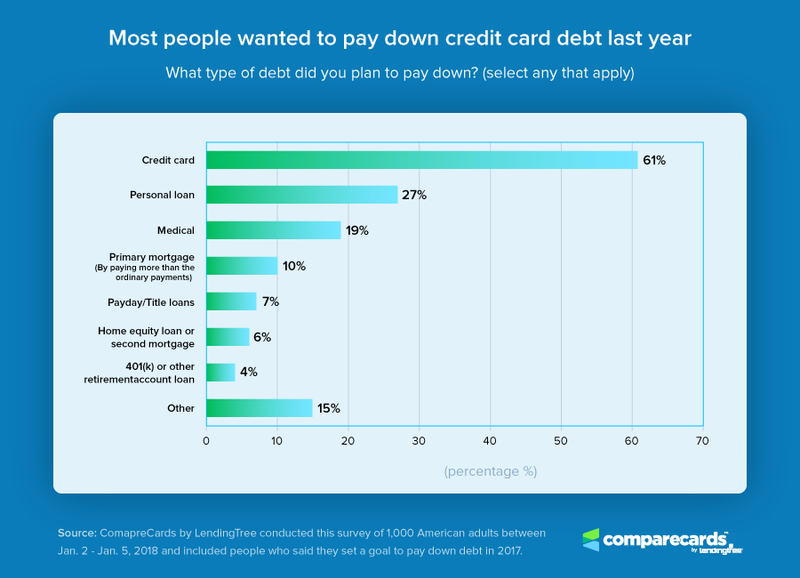 Not surprisingly, credit card debt topped the list of types of debt that Americans wanted to pay down, CompareCards.com found. Sixty-one percent planned to pay down credit card debt in 2017. Personal loans snagged a distant second spot at 27% and medical costs third at 19%. Some Americans turned to financial products like balance transfer credit cards to get out of debt. Balance transfer offers were the most popular — 14%. The third most common financial product used was personal loans, which came from a bank or financial institution — 8%. 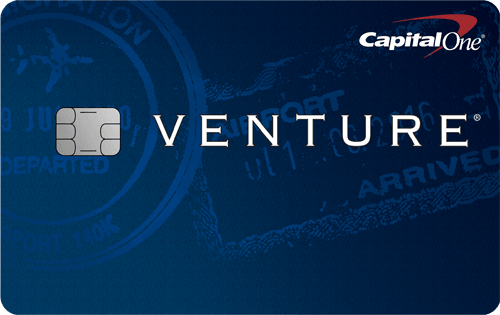 A balance transfer credit card offers a way out of high-interest monthly charges. A balance transfer allows people to move high-interest debt from one credit card to another with a 0% interest introductory period. 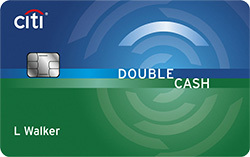 Some balance transfer cards offer a year or even longer of 0% interest, which can save people hundreds of dollars in high-interest charges. That gives people time to pay down debt, with no new interest charges piling up on that balance. It’s important to make paying off the balance during the introductory period a goal, if possible, to avoid new interest charges. Debt consolidation programs can help consumers struggling to pay off several debts at once. Typically, a firm will ask the consumer to make one monthly payment to the firm and the firm will then manage their debt payments for them, sometimes negotiating with lenders for better deals. A personal loan can be used as a debt consolidation tool. If approved, you can use a personal loan to pay off existing debts and you are left with one loan and one fixed monthly payment in return. Beyond the nuts and bolts of making a debt payoff plan and cutting spending, people who successfully got out of credit card debt point to a shift in mindset regarding spending, money and debt as a key factor in success. Nate Masterson, marketing manager at Maple Holistics in Farmingdale, New Jersey, changed his thought process to successfully retire his credit card debt. “I decided to treat it as a great red stop sign,” he told CompareCards.com. It is important to face up to your debt, too, says J.R. Duren a personal finance writer at HighYa.com. He and his wife paid off $22,000 in credit card debt after they got married. Those who overcome their debt get to a point where they believe they control their debt and it doesn’t control them, Duren adds. Credit card debt typically piles up over time and won’t disappear overnight. It is important to pat yourself on the back along the way. Staying motivated during the process is a critical factor in achieving success. You need to reward yourself for good behavior, Masterson adds. If getting out of debt is one of your New Year’s resolutions, make sure to develop a plan to help you achieve debt freedom. Know your number. Make a list of your credit card debts. Take inventory on your spending. Are there unnecessary expenses you can cut? Write down your plan to get out of debt. That could include areas you can reduce spending, consider a balance transfer credit card to take advantage of 0% introductory interest rates on balance transfers, and/or taking on a side gig. Nearly one in five people who successfully paid off debt said they earned side income, our survey found. Track your progress. Take stock at the end of each month. If you didn’t meet your goal, look at how you can adjust to stay on track. Reward yourself along the way. Celebrate achievements, like seeing your balance go down on your credit card or paying off a card completely. The journey to becoming debt-free may not be a quick fix, but in the long run new spending habits can create a financial peace of mind well worth the effort. 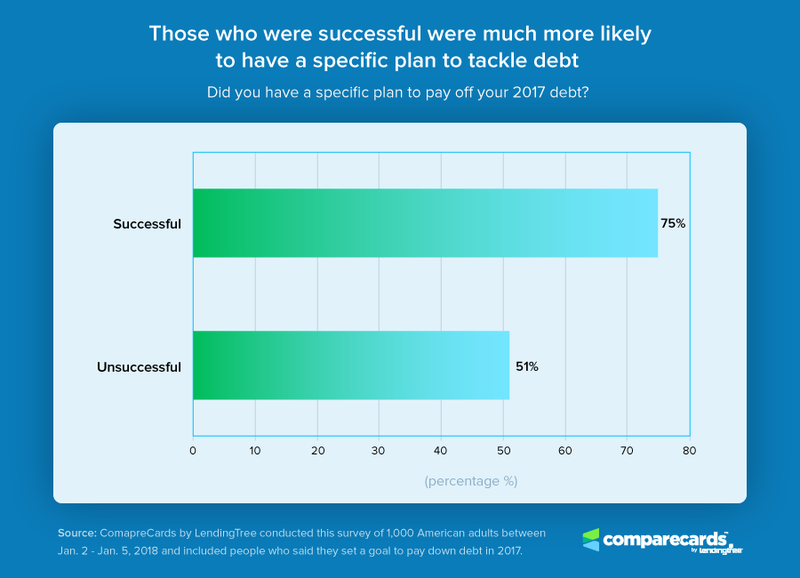 CompareCards.com by LendingTree commissioned Qualtrics to conduct a national survey of 1,000 American adults who said they made a goal to pay down debt in 2017. The survey was conducted Jan. 2-Jan. 5, 2018.